Recently, I wrote about how the future of surgery is going to be robotic, data-driven and artificially intelligent. Although it’s approaching fast, that future is still in the works. In the meantime, there is a real need to train surgeons in a more scalable way, according to Dr. Shafi Ahmed, a surgeon at the Royal London and St. Bartholomew’s hospitals and cofounder of Medical Realities, a company developing a new virtual reality platform for surgical training. 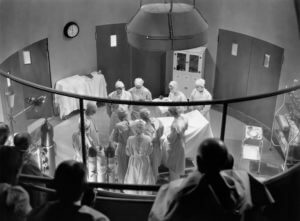 Hundreds of years ago, training happened in an “operating theater,” where many would-be surgeons peered over each other’s shoulders to try to get a glimpse of the action and learn as best they could. The reality is, this method of training still hasn’t changed much to this day. At the same time, two thirds of the global population still doesn’t have access to safe and affordable surgery. According to the Lancet commission on global surgery, the surgical workforce would have to double to meet the needs of basic surgical care for the developing world by 2030. Dr. Ahmed is working to solve this problem. He imagines being able to train thousands of surgeons simultaneously in virtual reality. Speaking at this year’s Exponential Medicine conference, Ahmed painted a vivid picture of the need for a scalable surgical education. Ahmed believes that education is a basic, fundamental right for everyone and that with virtual reality, he can train surgeons across the world in a way that has not been possible before today. Dr. Ahmed has already made some steps towards this reality. In May of 2014, he streamed a training session through Google Glass, reaching 14,000 surgeons across the world. In April of 2016, he live-streamed a cancer surgery in virtual reality. The procedure, a low-risk removal of a colon tumor in a man in his 70s, was filmed in 360 video and streamed live across the world. The high-def 4K camera captured the doctors’ every movement, and those watching could see everything that was happening in immersive detail. So today, we already have the technology to allow medical students to stand in the shoes of an experienced surgeon. What’s next for surgical education? “In time, we [will be] wearing gloves or body suits [so] we can touch and feel things in the virtual world. Then ultimately, imagine being a virtual surgeon, where you pop into a virtual theater [with] virtual patient [and] virtual instruments and do a virtual operation,” says Ahmed.